When part-time model and full-time prostitute Luciana Vetra is asked by one of her most exalted clients to pose for a painter friend, she doesn't mind serving as the model for the central figure of Flora in Sandro Botticelli's masterpiece "Primavera." But when the artist dismisses her without payment, Luciana impulsively steals an unfinished version of the painting--only to find that somone is ready to kill her to get it back. What could possibly be so valuable about the picture? As friends and clients are slaughtered around her, Luciana turns to the one man who has never desired her beauty, novice librarian Brother Guido. Fleeing Venice together, Luciana and Guido race through the nine cities of Renaissance Italy, pursued by ruthless foes who are determined to keep them from decoding the painting's secrets. 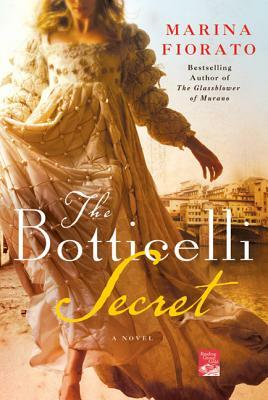 Gloriously fresh and vivid, with a deliciously irreverent heroine, The Botticelli Secret is an irresistible blend of history, wit, and suspense. Marina Fiorato is half-Venetian and a history graduate of Oxford University and the University of Venice, where she specialized in the study of Shakespeare’s plays as an historical source. She has worked as an illustrator, an actress, and a film reviewer, and designed tour visuals for rock bands including U2 and the Rolling Stones. Her historical fiction includes the Venetian Bargain, The Daughter of Siena, The Botticelli Secret, and her debut novel, The Glassblower of Murano, which was an international bestseller. She was married on the Grand Canal in Venice, and now lives in London with her family.